All transactions are safe and secure with a reliable history in online purchasing behind each of our associates. 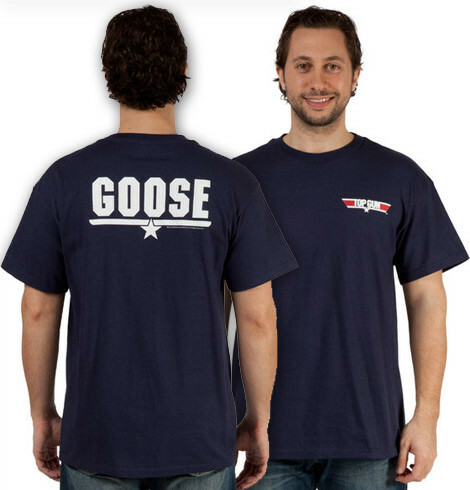 Buy the Goose Top Gun t-shirt to own Top Gun clothing and merchandise. Represent Lt. Nick 'Goose' Bradshaw (Anthony Edwards) with this wings style Top Gun Goose t-shirt. These navy Top Gun t-shirts are available in six different sizes. Goose is Maverick's Radar Intercept Officer (RIO). He operates the F-14 Tomcat's advanced computer and tactical systems. Naval Flight Officers like Goose are not qualified to pilot the aircraft. This doesn't mean that Nick 'Goose' Bradshaw isn't as cool as Maverick. After all, he is married to Carol Bradshaw (Meg Ryan). In addition to the Goose Top Gun tee above, browse the Top Gun Clothing Gallery for more apparel like men's and women's clothes, kids shirts or hoodies.